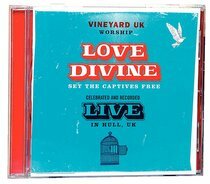 Featuring 12 of the very best recent Vineyard UK songs with Nigel Briggs, Wendy O'Connell, Matt Chalk, Matt Turrigiano, Kate Cooke and Soose Courtney, Love Divine is an incredibly passionate, honest album, expressing the true lament of the church for the nations, whilst declaring the hope we have in Christ. Wrapped up in great arrangements and unforgettable hooks, it is both a wonderful listening experience and source of inspiration for the church. Recorded in the town where William Wilberforce was born, raised, and successfully passed his historic bill, Love Divine commemorates the abolition of the slave trade. About "Love Divine (Set The Captives Free)"